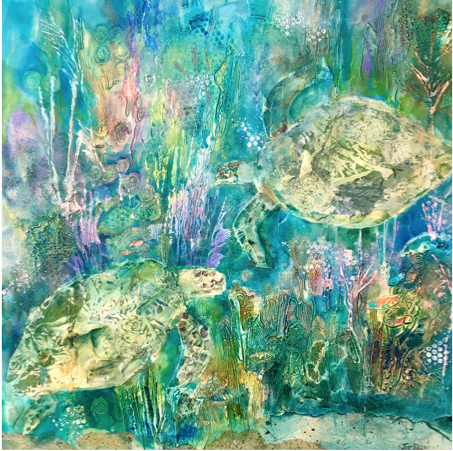 I have been selling my paintings of Coral reefs and Sea turtles through the gallery Art Provo, in Providenciales, Turks and Caicos Islands, for a few years. Recently, I was wondering why so many people seem to love and be attracted to sea turtles. I decided to do some research into the archetypal significance of the turtle. I came up with some fascinating information which I am happy to share. The turtle is one of the oldest reptiles on the earth, and thus has one of the most ancient mythologies surrounding it, in so many different cultures. In the Far East, the shell was a symbol of heaven and the square underside was a symbol of earth. The turtle was an animal whose magic could help you unite heaven and earth within your own life. In many cultures, it is associated with female energies and is a symbol of the primal mother. world. Turtles can teach us new perceptions about time and our relationship with it, particularly in our fast paced culture. It teaches the lesson of “slow and steady wins the race. Turtles carry their homes on their back. The shell is actually the backbone and ribs of the turtle. It serves as home and shelter for it. If a turtle is flipped onto its back it can right itself. It uses its strong neck and head to flip itself over. Turtles can act as a reminder to seek protection by withdrawing into our selves, or to use our head to right ourselves when our world gets topsy turvy. To the Native Americans, the turtle is a powerful old spirit and a symbol of Mother Earth, who provides for all our needs The Turtle is honoured for saving mankind from the great flood, in many Native American folk legends. 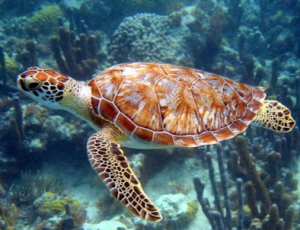 Perhaps part of our attraction to Turtles is that they signify so many important qualities. eg longevity, survival, creation, wisdom and prosperity. Turtles invite us to be serene, to trust serendipity and to take an easy slow approach to life. Life could be far less stressful if we could incorporate some of these characteristics into our daily life. References: Animal -Speak, by Ted Andrews.